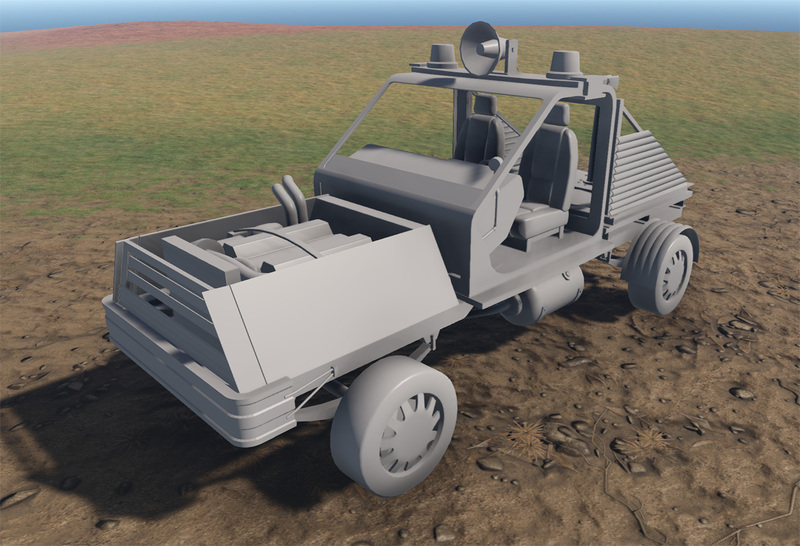 Lots of balance tweaks and fixes, stone spawn improvements, a look at vehicles, and more. 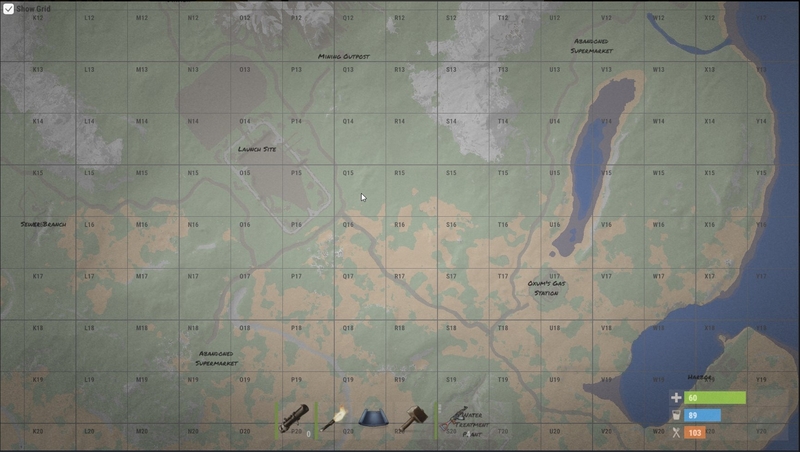 Now that the map is default, I feel like we have a bit more freedom to upgrade it as it’s not classified as a piece of paper. Earlier this week I fixed the Vending Machine tooltips, so that if a blueprint was being sold/bought it would display (BP) next to it instead of just the item name, which was kind of misleading. While players can not currently draw on maps, this feature is enabled for mods, so they can add images to it to support their gameplay. A bug where these ‘drawings’ would persist across game sessions was fixed. Speaking of mods, I added a little bit of extra support for drawing a radius of any color on the map. This should help with gamemodes like Battle Royale, where they want to draw the radiation radius. Also, if you’ve ever had a hard time describing where something on the map was to a friend you should be happy with this next change. I’ve added a grid, with coodinates as an overlay to the map. It is off by default, and you can toggle it with the top left button. Each grid is 150×150 meters, and are lettered along the horizontal axis, and numbered along the vertical axis. It’s a little bit ugly right now and has some minor artefacts when the map is in motion, but it works pretty well. One more thing, I added an explosion marker to the map wherever a crash site is. This is to say that whenever the Bradley or the helicopter are destroyed, a yellow and red explosion icon will appear on the map at the location of the crash site and will stick around for about 10 minutes. Have fun waiting for the fires to go out to get the loot now guys. Because the Bradley has a better load of loot, I’ve increased its respawn time so it only appears once every hour rather than every 15 minutes. I’ve also reduced the amount of ammunition it drops, making room for some other items, and I’ve slowed down its health regeneration. It will take 10 minutes before it starts to heal, and another 5 to completely heal. 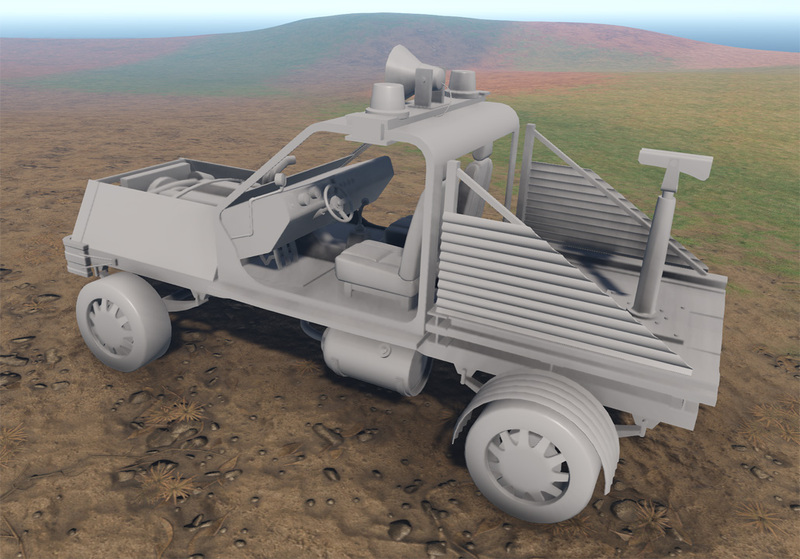 I guess I better finish its weapon systems, eh? There was a terrible bug with peacekeeper mode: it didn’t work. At all! Oops… This has since been resolved. Some people have asked me to remove the peacekeeper turret from shooting at animals. I kind of don’t want to do that right now because they’re not supposed to be outside in the open and this is somewhat of a deterrent for that. I’m not ruling it out completely, but for now you should keep them in private areas and not overlooking the beach, please. I’ve changed the airdrop loot tables to be much much less likely to spawn “good” guns, such as rifles and SMGs, and instead much more likely to spawn lower tier weapons, like shotguns and ammunition. 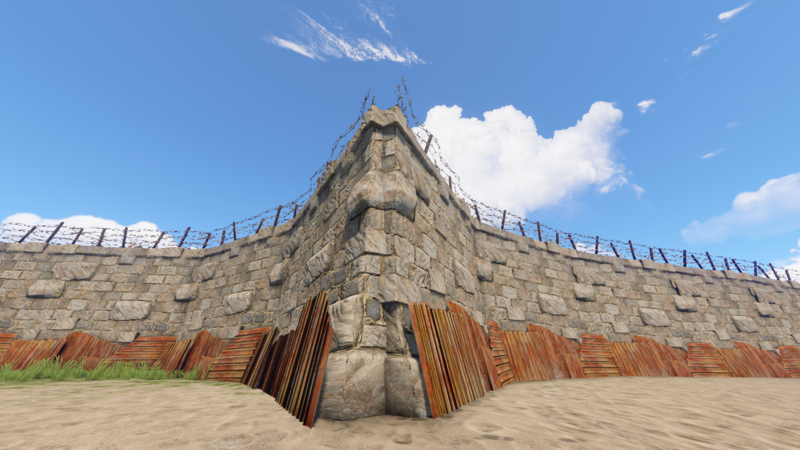 This is in an attempt to make the airdrop a PvP event for geared at lower-end players, while the launch site remains something for the higher-end clans. This will also help mitigate people with automatic weapons within the first 20 minutes of a server starting up. It’s not going to be perfect, but it’ll be better than what we had. I’ve taken a stab at the launch site, let me know what you guys think. First and foremost: the Hazmat Suit no longer protects 100% against the highest tier of rads. That means the one cooling tower at the NPP and the top of the launch site will leak a little bit of radiation. You can’t stay up there forever. Secondly, I nerfed elite crates a bit. 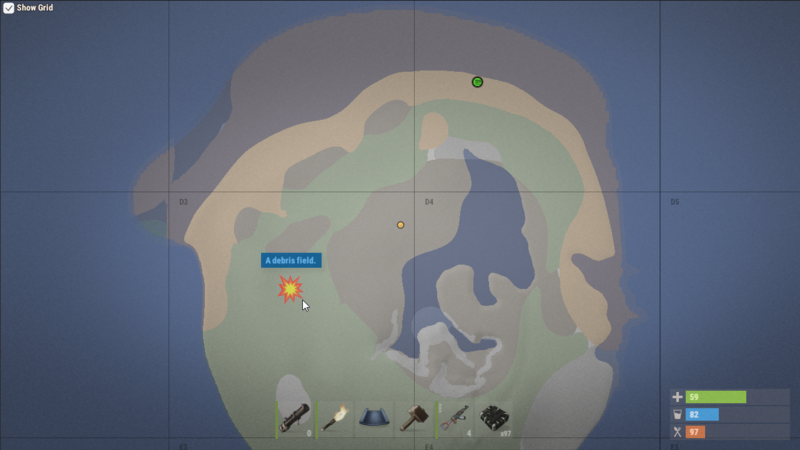 They spawn half as many items, and one fewer spawns at the launch site. They also respawn every 2 hours instead of every 20 minutes. Thirdly, the Bradley loot table is now similar to that of the elite crates, and it drops 3 of them. This means you’ll have to destroy it to get the good stuff. 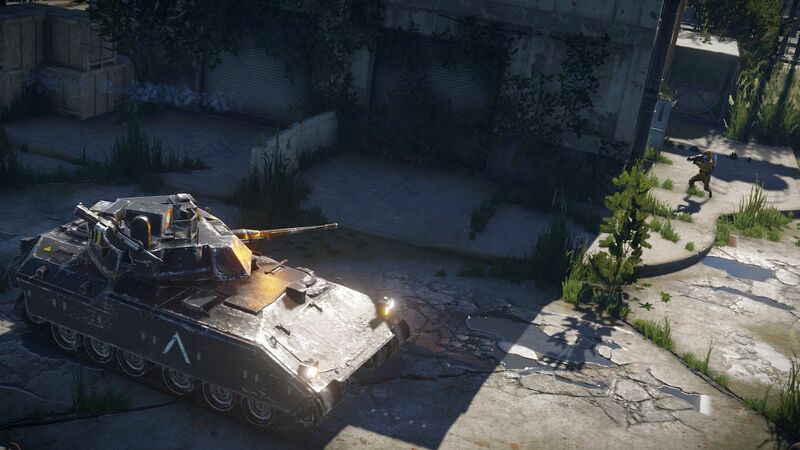 My thinking here is that you should have to invest what you have to get something better, so you need to use explosives on the Bradley to get some more advanced items out of it. By increasing the delay at the launch site, and removing the ability to camp it completely, large groups of players would have to wait in slightly more precarious places for longer amounts of time, increasing their exposure to errant shots from other players. I hope this gives people more of a chance to loot what is up there and they can instead focus on taking out the Bradley if they want a sure thing. I’ll listen to feedback and adjust this in the coming weeks, but this should be a good start. The Stone Spear and the Water Purifier are now both default blueprints as they should have been. Oops! The Ceiling Light, Guitar, and Planters, have all been reduced to a lower scrap tier. I’ve also changed the Flamethrower to require a level 2 workbench instead of level 1, so that people cannot endlessly flame wood bases. Although funny, this was a real problem. I’ve lowered the Hoodie and Pants to a lower scrap tier, so that they only require 75 scrap to research. Also, an attempt to make some more items viable was made. The Snow Jacket and Vagabond Jacket now only cost 50 cloth to craft instead of 100/200. I can’t imagine where that number even came from, jeez. Cave loot tables have been overhauled. You can expect to find fewer Miner Hats and Candle Hats, and the hats you do find will come with less Low Grade Fuel. It was ridiculous. I must have had about 800 stockpiled. You’ll also find less HQM, (1-2 instead of a solid brick of 5). Lastly, I’ve added stone tools to the crate loot table, with a reasonably high chance; in exchange I’ve lowered the chance of finding salvaged tools in there. They are still in the loot table but you’re going to find stone ones more often. You’ll notice this patch that the candle hat is much dimmer. This is because there was an errant zero added to its light radius making it the brightest light source in the entire game other than the spotlight. Wow! It had a range of 50 feet. This has been fixed. I also fixed the bug with the miner hat where the emissive portion of it would remain on at all times when viewed by other players. This meant if you were wearing a miner hat and had it off, people could see your head like a beacon. Sorry about that. 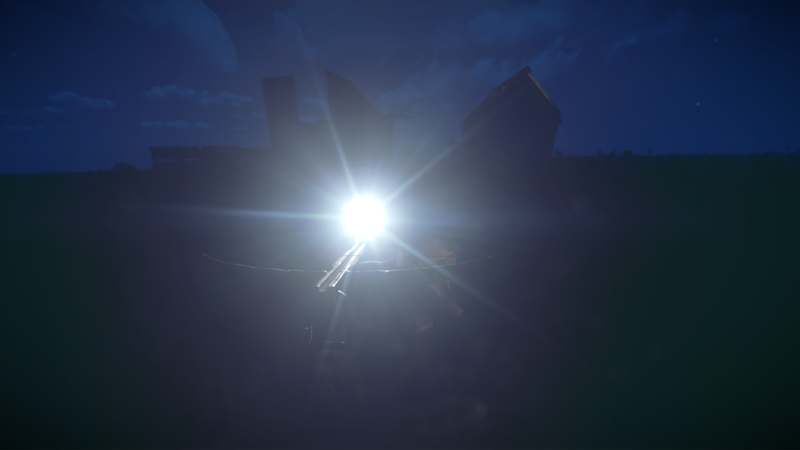 I’ve also added a blinding flare to the miner hat, similar to the flashlight. Maybe this will give you a very slight edge during combat, or perhaps it’ll just act as a target. You decide. As mentioned elsewhere in the blog, I also added some minor protection to both pieces of headgear, The Candle Hat is the same as a cap, and the Miner Hat is the same as a Burlap Headwrap. Not much, but many times better than nothing. 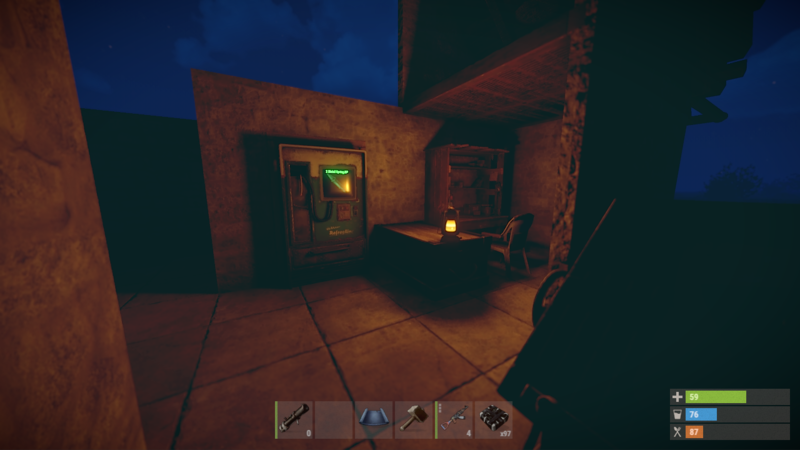 There was an exploit involving a chair and the workbench which would grant you workbench access anywhere on the server. This is now fixed. I’ve also increased the workbench radius by about three times, so you can move around a bit next to it while crafting. 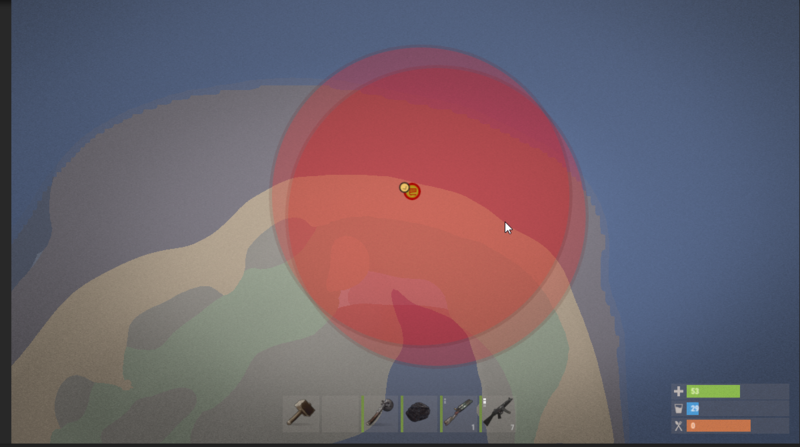 I had to add a visiblity check as well so that people couldn’t use it who were outside your base. You can also rotate workbenches with the hammer if you somehow (???) place it the wrong way. This brings up the conversation regarding craft times. Some people have suggested making it the range of the tool cupboard, but thats kind of lame. I think instead we should just lower all items crafting times to no more than a few seconds, or at least add some kind of minigame that will complete it instantly. I’m sick of hearing about it and I guess its somewhat annoying in some cases. I will say that having no crafting time at all makes it feel less satisfying to craft something. We’ll figure something out. I’ve added protection values to the Boonie Hat, Cap, and Bandana. I’m happy about this because they look way cooler than the Burlap Headwrap and you can get as much if not a little more protection by stacking them. I also added some protection to the Miner hat and Candle hat, so they’re not nearly as useless. I eff’d up the blueprint system a bit last week and all the Steam items, like Town Signs and Picture Frames, hats, etc., were not craftable, even though you had the Steam item. This is now fixed so you should see a bunch of “NEW!” items available when you fire up Rust. I also fixed a regression that was allowing these signs to be researched. 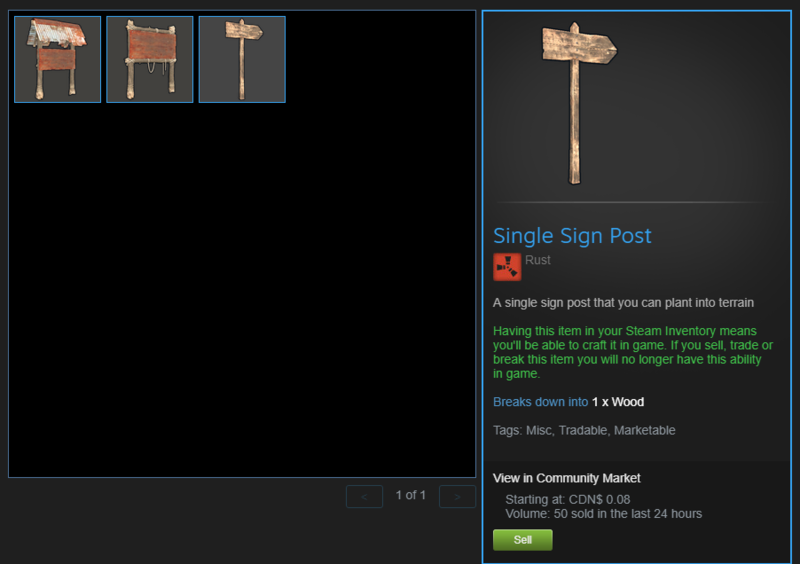 You can now only craft them if you have the Steam item. They don’t impact gameplay in any way, and are given out for free all the time just by playing, and they’re also like 5 cents on the steam market, so I don’t think this is a huge deal. 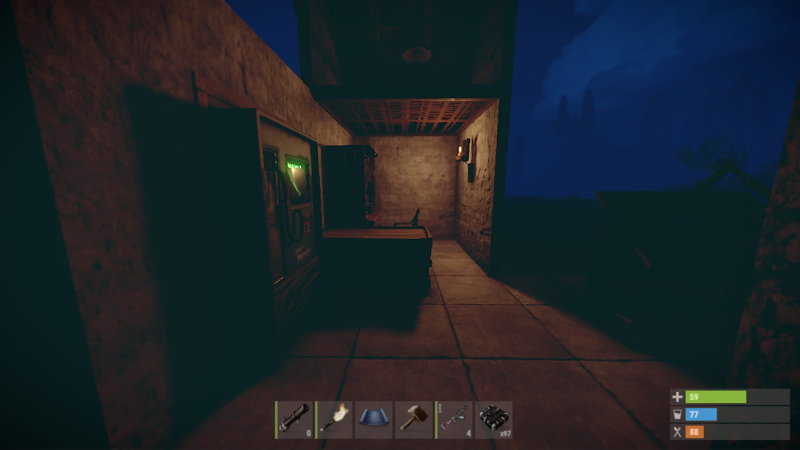 It’ll be a little easier to see inside your base at night now. 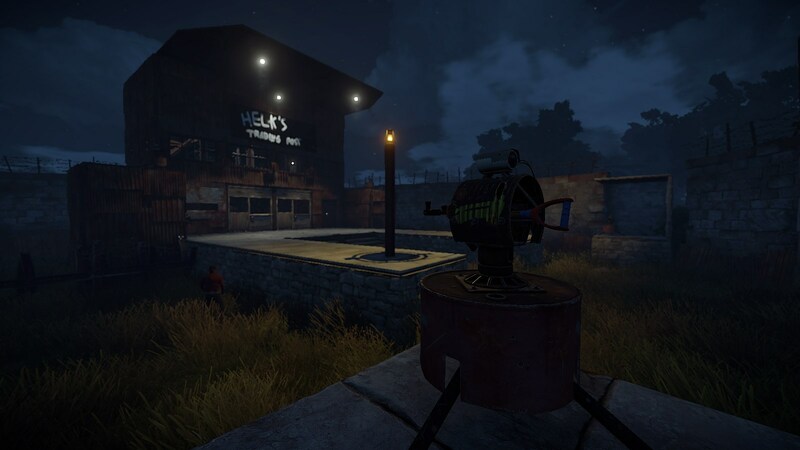 Both Lanterns and Tuna lights are much brighter with a larger radius, and they’re also cheaper to craft: the Lantern costs 25 Metal Fragments instead of 40. I also did some minor tweaks to their color and light animations. Enjoy! Wow the map got littered with garbage really fast, didn’t it? I made some changes to the pick up code so that you can now pick up most objects if they are outside of any tool cupboard range: this means if someone places junk by the road, feel free to take it and recycle it. Free resources! I also made some changes to help with base renovation. The Repair Bench and the Research Bench can be picked up and moved. I did not apply this to the Workbench because its high health would lead to exploits, such as moving them infront of your doors to seal you and your loot in. I will come up with a solution for this soon. I’ve changed how some of the simpler, deployable items are spawned in barrels and crates: you will find the blueprint for it instead of getting the full object. This should help with people throwing garbage down everywhere, and maybe people will start making some of these as you no longer need to waste scrap to learn them. Because you cannot repair items without knowing their blueprint (for now), having a stack of broken high end gear was kind of a tease. I’ve changed the recycling ratios up so you get a minimum of 10% of their resources when recycling broken items. I’ve also halved the amount of rope in sewing kits, so you will see about 1/4 when recycling. This might need to be expanded further. 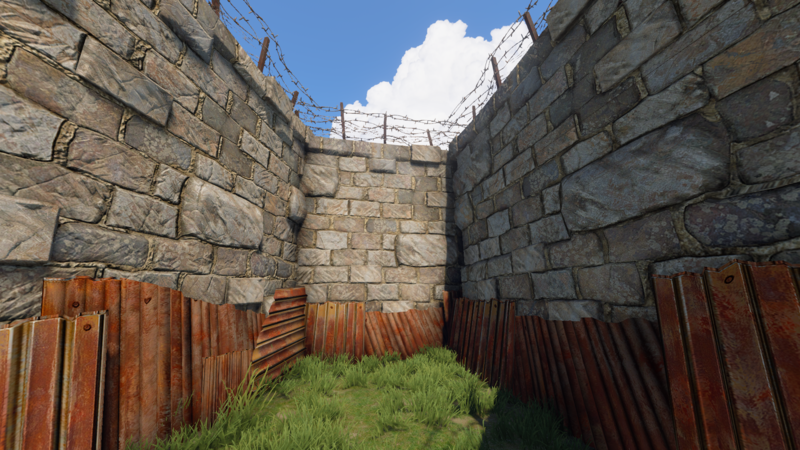 It could be a bit tricky to place the last wall piece when walling in a compound. I tweaked the deploy volumes to allow a number of useful placements that should make things easier without sacrificing the minimum enforced distance when trying to stack walls. You know how stone nodes were way harder to find than metal or sulfur nodes? This was primarily caused by the fact that the resource spawner used a simple dice roll to determine what resource to respawn whenever something was harvested. This gives the correct result when people harvest all resources at about the same rate, but if they massively focus on a single resource this resource will become more and more rare as other resources will block their spawn locations. I’ve changed this so the spawn handler now respawns resources in a way that the end result is guaranteed to always look like the desired resource end distribution. This means that if people only harvest stone nodes and ignore metal nodes entirely, only stone nodes will respawn. One thing to note is that this change will only be applied slowly over time if your server loads a save since the resources that are loaded from the save are of course still the same they were before the update. If you want to fasttrack this as a server owner, delete the existing ore entities and let them respawn from scratch. We discovered a packet exploit that could be used to bring down servers by getting them to spam messages into their log file. We quickly found and fixed the issue and to make sure this doesn’t happen again I added a log convar that can easily be toggled to completely disable server logging at runtime. 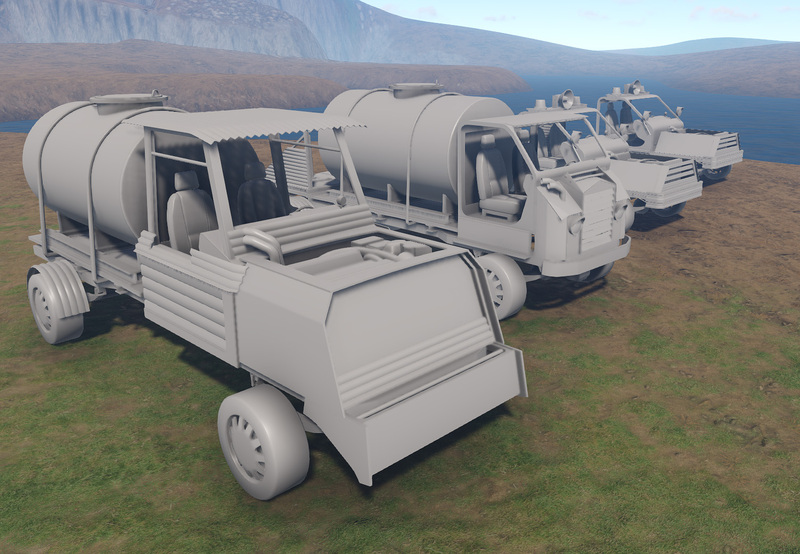 I started to produce temporary art (greybox) models for our vehicles on a separate branch. We’re going to approach them in similar way to the concepts Howie made: we’ll create vehicles around a ‘chassis’ or base that will vary in length, and on the chassis will be sockets that you can plug in modules. 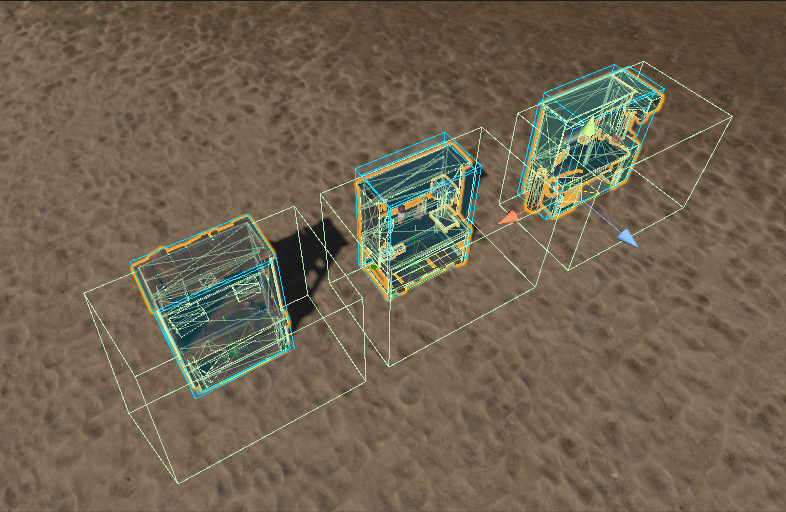 Much more work is required in discovering and fine tuning how modules will work alongside the frame with each other. There’s not much point going into the specifics at this stage, because many things will change when it gets worked on, but here’s a peek at what I have so far. 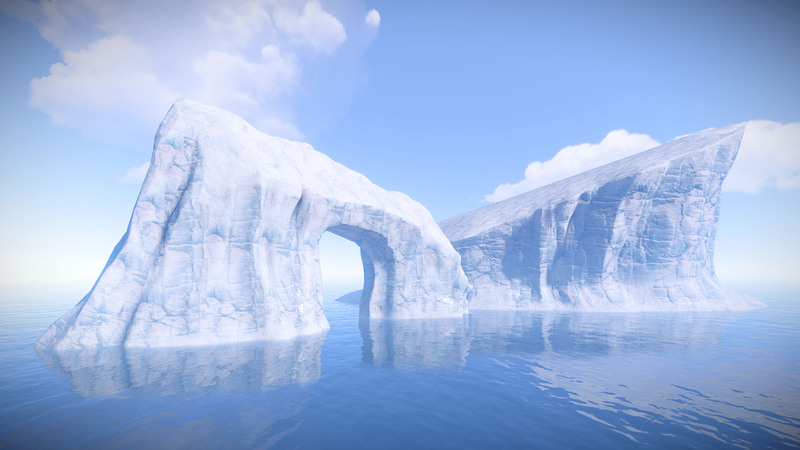 This week I’ve been working on the various bits and pieces required for the iceberg rework. I have focused primarily on creating a set of tiling materials in Substance Designer that will be used across the snow biome. I also made some high poly ice sheet models and explored various texturing and blending techniques to find the best approach to remove seams across those large iceberg meshes. Sadly, there’s not much to show this time around as I need to put all of those elements together, but all of this was the necessary busywork. Below is a quick sneak peek at what fully textured icebergs will look like. This week sees the merge of all the viewmodel clean-up work. Visually, the only update you’ll see is a new set of arms. We are now in a good place to begin viewmodel clothes tests, once Taylor gets some free time to create some test meshes. I’ve also been working through some bugs and any other visual issues I’ve come across. 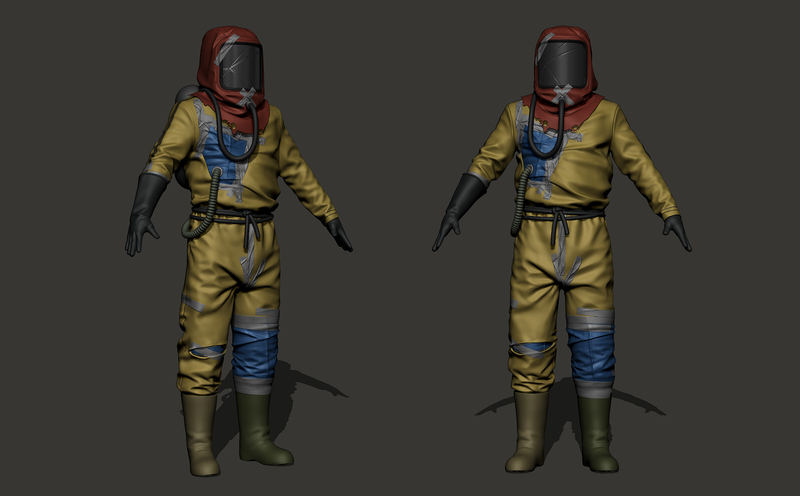 More progress on the makeshift hazmat suit this week. Elements of it are still rough, but I’m happy with the direction it’s headed. I’ve had a lot of fun trying to achieve a cobbled together look with lots of duct tape holding everything together. I want to push it even further and I’m looking forward to really weathering the fabric as much as I can to contrast the clean look of the scientist’s suit. They were caused by a bug in our screen-space water reflections code. The sample below was taken from the top of the Lighthouse. There were other cases where the issue was prevalent and distracting, especially in and around water. The artifacts look mild but they may look a lot worse depending on graphics configuration, light conditions and motion. Last week’s viewmodel shadow fixes introduced a new bug in other visible in areas. It took some work to manage this bug without affecting the viewmodel, but I finally nailed it. 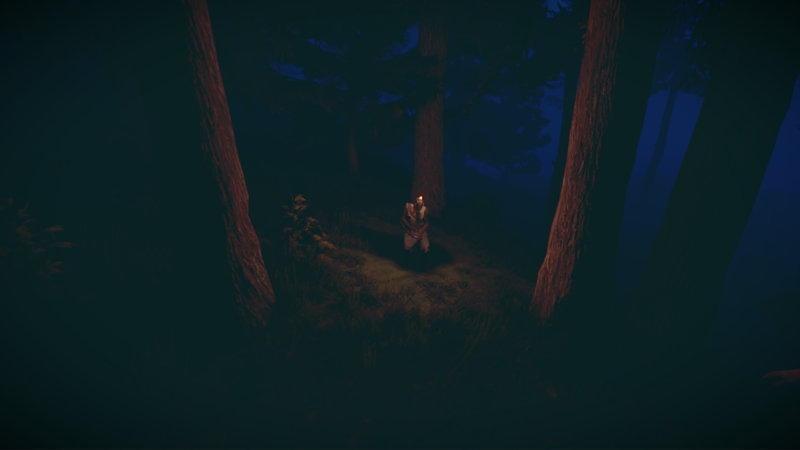 Interior shadows should be back to normal now. Another issue that went unnoticed during last week’s viewmodel shadow changes was that viewmodel’s legs below the knee were invisible in the shadow. This was fixed as well. The leg shadows should now be visible and matching footsteps as closely as possible. Went back to hair integration work this week to help the team make a final push. I improved the shader a bit to support all anti-aliasing modes and lent a hand with performance testing and pipeline work. It’s been moving slowly but shouldn’t take much longer now. We’re closing in on a fast and flexible solution. We’ll keep you posted.